In Elasticsearch 6.5, we added a new field type plugin: mapper annotated text. The text field type is familiar to most users of Elasticsearch. It is what we use to index content like the text of this document. Elasticsearch breaks a large free-text string into multiple smaller tokens (each token typically representing a single word). The tokens are then organized in an index so that we can efficiently search for these entities. Many subjects are multiple words, e.g “John F. Kennedy”, but are indexed as independent tokens john f and kennedy. Searchers looking for John F Kennedy would have to use phrase queries to ensure the tokens are grouped so you don’t just match everyone called John. Single words often relate to many subjects e.g “JFK” in a document could refer to the airport, the president or a movie. Searchers for the president would potentially mistakenly match the airport. A subject may have multiple aliases e.g. JFK or John F. Kennedy. A searcher would have to use OR expressions to match all of the aliases. These problems can be overcome if we search for “things, not strings” (aka Entity Oriented Search). This approach requires that the subjects of interest in text are tagged with unique IDs. As internet users, we are already quite familiar with the use of annotations. This document contains several of them in the form of hyperlinks. In each case, the hyperlink was used to enrich selected words used in the plain text with a link to the definitive article on the subject they reference. Annotation values don’t have to be URLs, but any form of string that uniquely identifies a referenced subject is typically the goal. Note that, like text fields, you can use an arbitrary choice of analyzer to tokenize the plain-text values as you wish, but any special annotation values are indexed untreated by your choice of analyzer. The content of annotated text fields uses a Markdown-like syntax to add annotation values to selected sections of text e.g. "my_rich_text_field" : "Today [elastic](Elastic+Inc.) announced"
Note that the “Elastic Inc.” token appears at exactly the same position and offset as the word “elastic” to which it was anchored. In this respect it behaves like a synonym, but unlike synonyms, we aren’t employing a one-size-fits-all rule that says all uses of the word “elastic” must also be tagged as “Elastic Inc.”. An annotation is more focused, limiting the scope to this particular use of the word “elastic” in this particular document and sentence. A document that talks about “elastic waistbands” would not be similarly tagged. How can I use annotated text? Great question. Now that you have structured information woven into your unstructured text this opens up some interesting possibilities. You’re now in the position to search for “things not strings”. By this we mean that regardless of the word strings used in the original text (and any ambiguities, aliases or typos that may entail) you can now search the text using unambiguous, normalized IDs for your subject of interest. Precision is increased because our search for elastic the company does not match documents talking about elastic waistbands and recall is increased because we also find those documents where the authors insisted on calling the company “elasticsearch”. Highlight the text to show exactly where your subject was mentioned. Use positional queries, e.g. find documents where a “Search_Company” was mentioned next to the text “announced” or “released”. In this example application we are looking at Wikipedia content. The user is shown a bar chart from a structured keyword field “person” which holds just the IDs of articles about people. The user has clicked on the “John F. Kennedy” term to preview examples of where this value is used in the text of articles. Note that the highlighted text snippet is the string “JFK” but because it was annotated with the id “John F. Kennedy” it matches the search and is highlighted in yellow. This is a good example of what it means to “match the thing not the string”. "text": "...including [JFK](John%20F.%20Kennedy) for ..."
Note that the client application has ensured the annotation tokens used in the “text” field are URL-encoded and included in the structured field “person”. The highlighter used must be of type annotated. The require_field_match parameter must be set to false so that our search term strictly targeting the person field can be relaxed to highlight tokens found in the text field. Note that the result includes a combination of the original annotations and search matches. The annotated highlighter doesn’t use <em>...</em> HTML style markup used by other highlighters but reuses the [..](..) Markdown syntax to highlight search hits. The example application chooses to display annotations with blue text and any search matches (which are prefixed with a “_hit_term=” annotation) are coloured with a yellow background. In my dataset, all elected politicians are tagged with the “OfficeHolder” type from DBPedia so this can be used in queries or highlighting. Note the use of the “&” character to inject both the “John F. Kennedy” and “OfficeHolder” annotations. Great, where can I get hold of annotated data? The examples used in this blog were based on the human-authored Wikipedia content. The original content is XML format and using a Wikimedia parser it is possible to extract the hyperlink URLs and use them as annotation values around the text they cover. 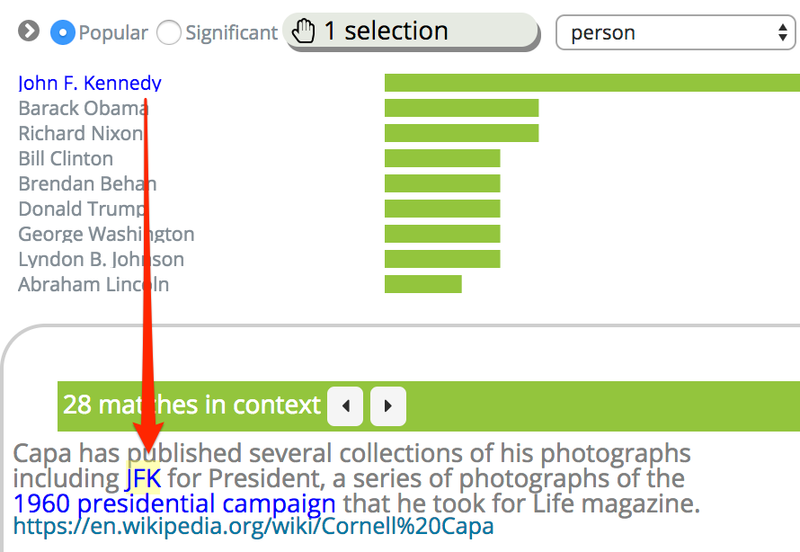 The DBPedia ontology can be used to add further annotations, e.g that the Wikipedia article with the ID “John F. Kennedy” is of the types “OfficeHolder” and “Person”. Each document that includes an annotation link to JFK can therefore have these links enriched with this extra type information. Once you have unique IDs like this it is possible to pull in all sorts of linked information. Review the highlighted entity matches and select the most likely entity id (e.g. entity #5323464) or create a new one if this looks like a new person name. Tag the plain text with an annotation of the chosen entity ID and update the document. Commercial NER tools such as Rosette or open source tools like OpenNLP can identify named entities like people, organisations and places in plain text. With some client-side coding these APIs can be used to create the specific annotated text format used in Elasticsearch. aliases (same person, different names). When adding annotations to text it’s important that your annotation values do not clash with regular strings that might exist in the text or your searches will have some irrelevant matches. If your entities are people names then the fact names contain whitespace to separate first and last names and use uppercase for the first characters means they are unlikely to clash with any text tokens produced by the standard Analyzers. However, if your annotation is a single word lowercased e.g. the company “elastic” then there is a potential for mismatch. Prefixing the annotation value with a type string and a character that is stripped by the text analysis pipeline is one way to ensure there is no overlap e.g prefer “company: elastic” rather than just “elastic”. We’re pretty excited to see how this feature will be used, so go try it out. Let us know what cool new user interfaces you build or annotated datasets that work well. We’re keen to get some feedback on the discuss forums.